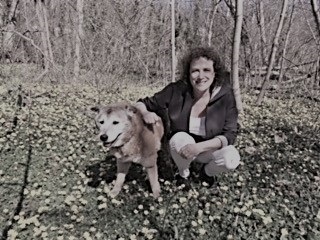 I didn’t have pets as a child and have never faced end-of-life decisions, for either a person or a pet. And so Sally and I sail blithely on. Well, Sally’s 14, so that’s no surprise anyway. We start her on meds and carry on with our routines. Three months ago: The lump progressed quickly from golf ball to tennis ball and is heading toward baseball. She’s on pain meds round the clock and occasionally falters but her spirits are unflagging. The vet adjusts her meds but we all know the cancer’s growing. We walk by the river. We walk in the woods. She sits on the floor while I type and on the rug for movie nights. I find splotches of pee once or twice in my son’s room. Last month: No matter how frequently I walk her, Sally keeps peeing on my son’s carpet. The vet checks her, checks her urine; her kidneys are starting to shut down. I steam clean the rug and it reeks again within days. I talk to my son about it – his room smells like the monkey house at a zoo, no matter how much I scrub – and he says he doesn’t care about the rug, he cares about the dog. Three days ago: Her tumor is the size of a grapefruit and she is starting to limp. The pee is unabated. I tell myself she’ll have good days and bad, and that the good ones remain many. Two days ago: The fur has suddenly fallen off a large swath of the tumor. The exposed area is red and angry. I call the vet, who says to bring her in for a shot of antibiotics or maybe draining it. But she also tells me that Sally’s entering a new phase: the tumor could burst. Yesterday afternoon: The red patch has expanded even in a matter of hours. I bring her to the vet. She tries to keep a poker face but hey, she’s human. I can tell by her expression that the news will be bad. There’s no point in trying antibiotics. The tumor could burst any moment. And there’s another one growing on her throat. The three of us sit for what I know is our final movie night. This morning: At the vet’s suggestion, I give Sally a sedative to take the edge of the anxiety of another office visit. I put her in the car with us when I drive my son to school—she’s been using a dog-ramp to get in the car for weeks now—but it is his second day of middle school. Torn inside, I decide not to tell him what the morning holds. I drive straight to the vet’s, tears streaming down my face. The staff greets us with somber expressions and hugs. They know. What if I’m making a mistake? The vet gives me a sad smile and takes another look at the pulsating tumor. I nod. A tech lays down a blanket for Sally and I lay down beside her. The doctor and tech huddle along with us. I cradle her head in my arms as the vet gives her a muscle relaxant, and then the lethal injection. We all three pet her, murmur to her, try our best to comfort her. I am sobbing, and don’t even register the exact moment that she dies. The vet and tech leave the room to give us privacy. I stay with Sally’s cooling body, crying and thanking her for 12 glorious years together. From now on: I have a young boy and two cats, but my house is silent. No jangling of Sally’s collar’s tags, no clicking of her nails on the hardwood, no thumps as she commando-crawls into or out of her favorite spot: under my bed. For twelve years, I’ve not left the house for more than six or seven hours without making sure I zipped back to let Sally out, or making sure someone else would. For twelve years, I’ve walked her in the heat, the cold and on glorious autumn days. For twelve years, her joy at my presence washed over me whenever I returned from somewhere without her. She is the one no longer wearing a collar or leash, yet I am the one now untethered. This first appeared in Dogs Today (UK) on September 13, 2017.